I read a posting this week from BETWEEN NAPS ON THE PORCH. She spoke about removing her faux/silk greenery arrangement that was placed above her armoire to hide the dreaded sound equipment. So then I realized how many silk floral arrangements and greenery that I have. 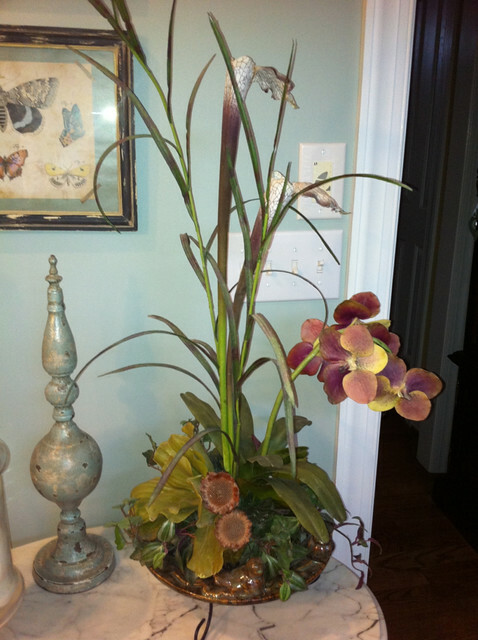 I love my silk arrangements that add so much color and texture to my decor, but is it time to lose them? It’s not like they are, for lack of a better word, “cheesy”..they are for the most part, NDI quality silks. So, I will leave it to you to help me decide: LOVE IT…OR LOSE IT!!! 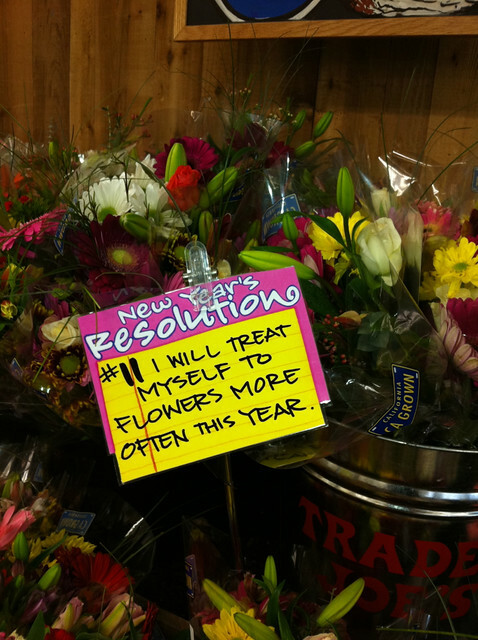 On my weekly trip to Trader Joe’s yesterday, something spoke to me…Ditch the fakes and buy me..the real ones!! So I bought an orchid!. Better? 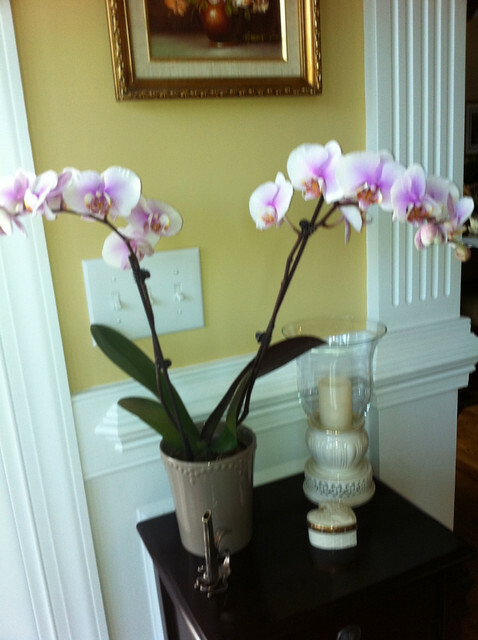 I replaced a silk floral arrangement with this REAL orchid from Trader Joe’s. After I returned home from a long afternoon of my food shopping errands, my hubby and I drove to the car dealership to drop off one of our cars for service. 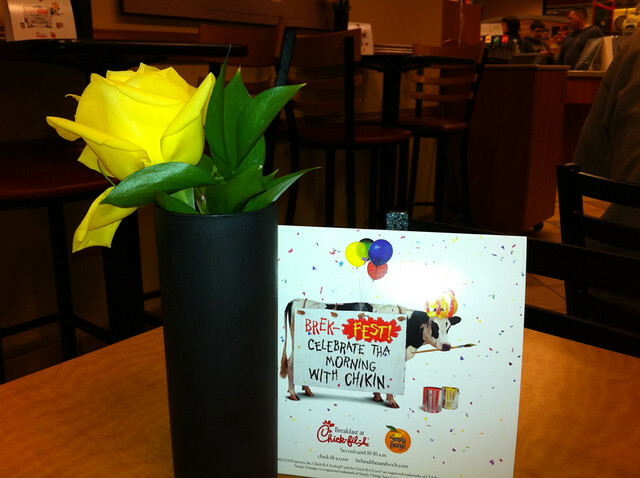 So, not really wanting to cook when I got home, we stopped for a quick bite at Chick-Fil-A….When we sat down, there was another message speaking to me…fresh flowers!..There were fresh yellow roses on each table at Chick-Fil-A. They always have fresh flowers on their tables..So was it another sign to ditch the fakes? 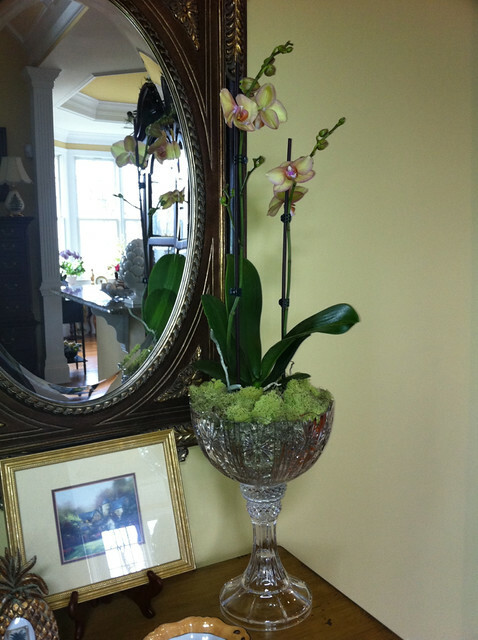 A silk orchid arrangement in the master bath. I really like it, but do you? Love it or lose it? 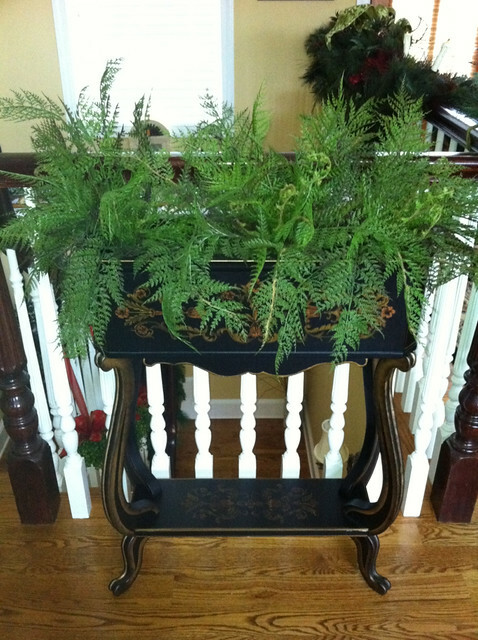 A planter filled with ferns..I really think they look life-like…Love it or lose it? 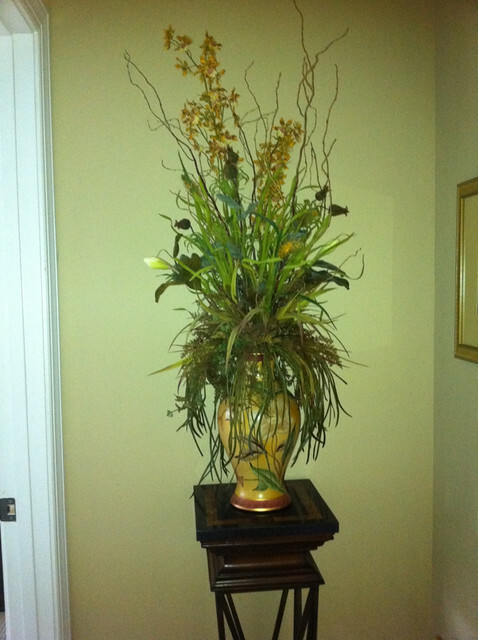 A large decorative vase filled with silk greenery and orchids. Have always loved this arrangement, but should I let go? A Christmas tablescape in the guest room. 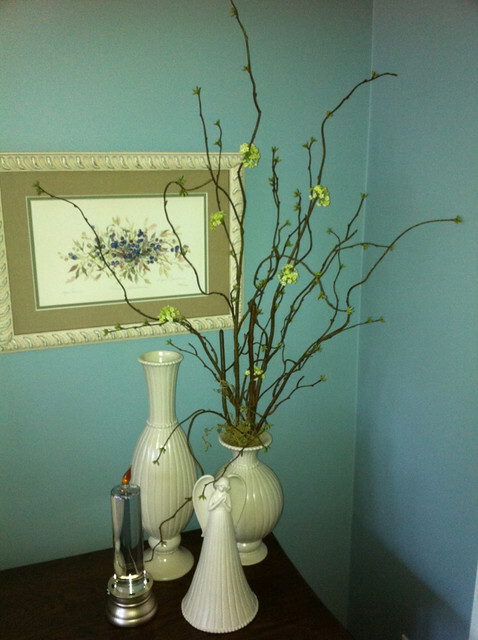 A vase filled with willow branches and hints of green buds. I love the height and texture it adds to the space, but do you? Should I love it, or lose it..I oh so love it! Depending on my mood, this arrangement seems to flip between the dining room table and then back to the table in the same room that is in the bay window area (hopefully soon to be a window seat there!). 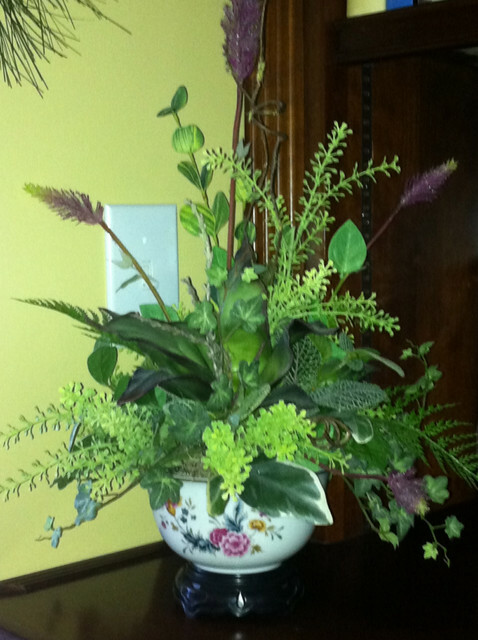 The arrangement is in a very special porcelain container with silk florals and greenery. A small arrangement to take the focus off the fireplace switch. Mostly greenery in a porcelain cachepot. So should I leave the cachepot empty? 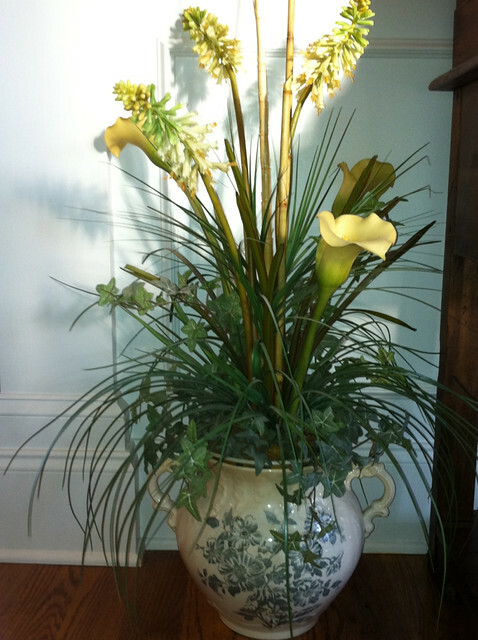 Silk greenery and some flowers in an antique transferware double handled vase. It is somewhat tall, so it sits on the floor next to the dining room hutch. Love it or let it go? Well, I mean just the florals! 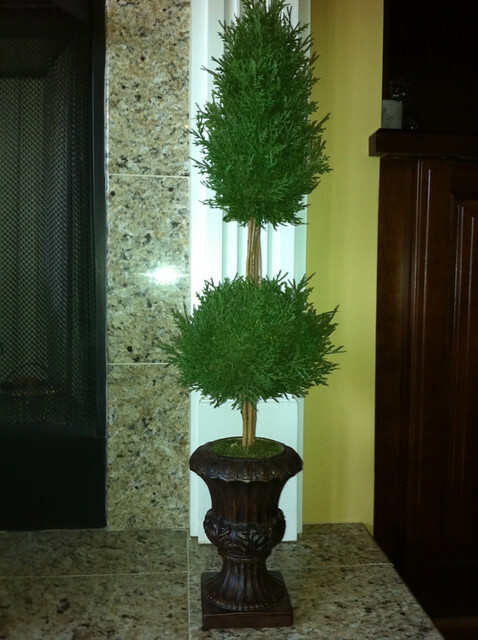 My faux topiary. I use the pair of them in various vignettes throughout the house. I am thinking about painting the container white..I really think I am not going to lose this one! I have several more silk arrangements, but I want so show you that I have some real ones too…These are just a few..I mix them in the the “fake”.. The above orchid was a gift from a friend for my birthday..so beautiful and happy in that place. So you have seen “both sides” of the argument..What say you? LOVE IT OR LOSE IT??? Love this article, Shirley. Do you really want to hear my answer? I say leave it. I have heard and read from many decorators to treat yourself to fresh flowers each week and only use live greenery in your decorating. I think you can do it gradually mixing a few remaining silks that you can’t quite part with yet with the real deal while you transition to a natural, organic look. You can get texture and color in other ways and you are an expert at that! I’m trying to do the same thing in my own home. I love Chick Fil A and in addition to always having fresh flowers on the table they offer cracked pepper for your salad. It’s those little touches that add a some class even to a fast food restaurant…same in our homes. Hey, I really thought that you would say lose them all! !..We have had this discussion before. Remember the 10 worst decorating faux pas..Number one was fake flowers. And, you know Nate really does not like them either! But really you know mine are look pretty true to life, or at least I want to think they look that way! I have so many real ones too..did not want to bore everyone with all of them…Thanks for the advice my friend.. I am of the opinion that if YOU love it, it should stay, Shirley! I love many of your florals, faux and real. Thanks Kathy! I truly appreciate your expert opinion! I say LOVE them ALL. Thanks Merry! !..You are the best! Hi Shirley! Honestly, I need a mix. There are a couple of areas in my home that a live plant or floral just won’t cut it because of lighting; but, I need that burst of color. One of my first posts this year was on this very subject. I am moving toward a more natural look, and phasing ‘most’ of the silks out. Everything that I purchase going forward will be live. Read it too. 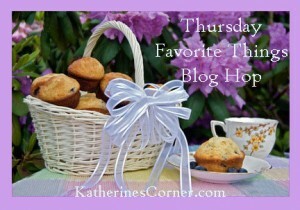 And if you see my post for Wow us Wednesday I just MAKE a new faux arrangement. 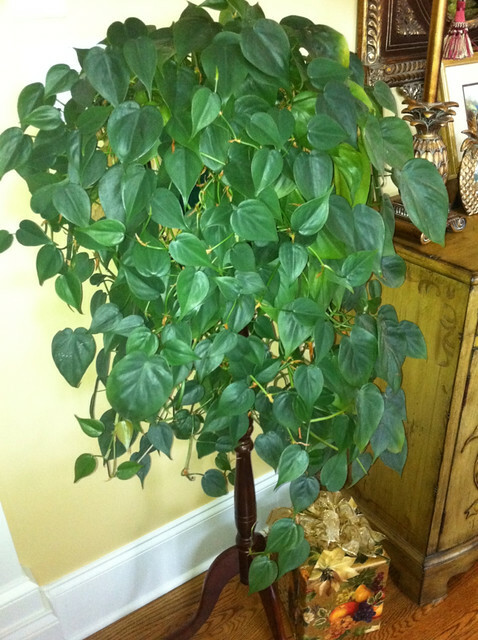 Yes, I may get rid of my fake trees – I have several- but no WAY I am getting rid of my arrangements. I think that large one you have with the red is absolutely stunning. Don’t give in to the current trend if it brings you joy to have that beauty around you, that’s my motto. Seriously I think they are fine. One of my favorite people that uses the faux alot is Mary Carol Garrity of Nell Hills. She has a way with natural looking materials and you have that going on with yours too. Her statement is that they look so real anymore why not use faux. Great post! I think the days of cheesy florals are behind us. With all of the beautiful faux stems you see these days, it’s perfectly fine to dress up your home this way. It adds a needed pop of color. I say love them! Even Pottery Barn sells faux florals! Who has time to take care of indoor florals? Too much water, too little water, who knows? Did my pet actually chew on it? I like faux greenry that adds life to a room and requires so little cleaning in return. Your containers are so pretty. The red arrangement is wonderful and looks expensive. I think you’d miss it if you let it go. Store some away for awhile and see how you feel later. Your faux arrangements are so gorgeous I thought some of them were real. I really like the formal one in the bay window. However, I happen to prefer fresh flowers or plants in my home…probably because I love plants and like to take care of them. I think what it all boils down to is if you enjoy the faux plants then keep them. If you’ve grown tired of them, replace them with fresh. It’s your home so do what pleases you and your family.Oh, one other thing, that you probably already know, is that live plants improve the air quality in a home… great especially during the winter months. 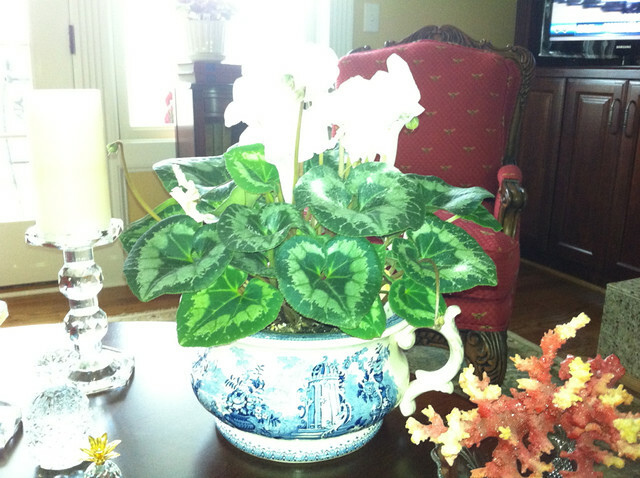 Thanks Babs…I believe I have just about as many live as faux..did not show all my plants. Yes, it does improve the air quality and I enjoy them. 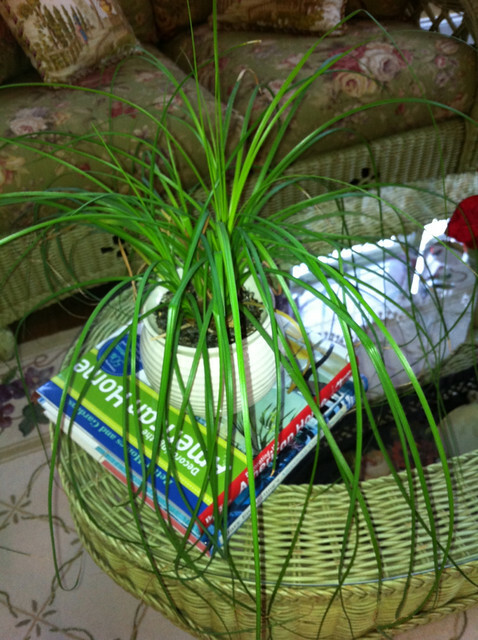 I try and have the live plants that are pretty hardy..we travel quite a bit and need them to be more low maintenance. Look forward to viewing your posts! Have a great day! 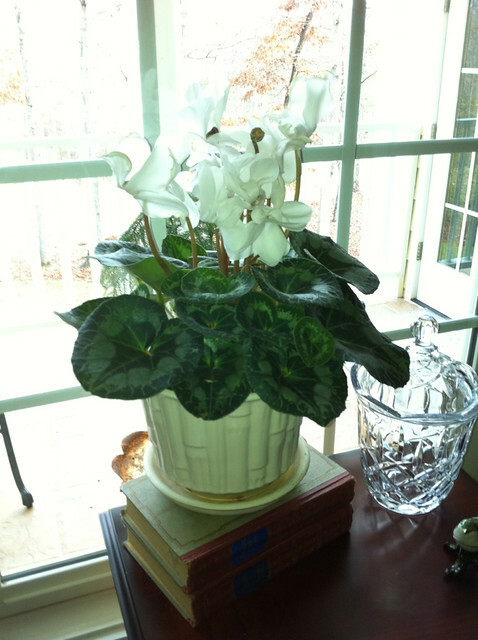 Thank you Rhoda!..I love using vintage or unusual pieces for planters. Seems to be more interesting! Thanks Stacy!! You are the best of the best! 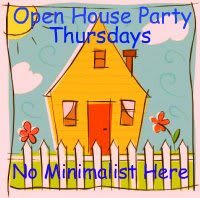 Thank you Susan!..You were my inspiration for this post. Just love “following you”.. The question is what will you do with the living orchid once the blooms fade? They’re rather plain plants without their exotic flowers – and tossing them out seems a little cruel. Another consideration is that the cost of replacing multiple fresh flower arrangements (even every other week) will soon add up. 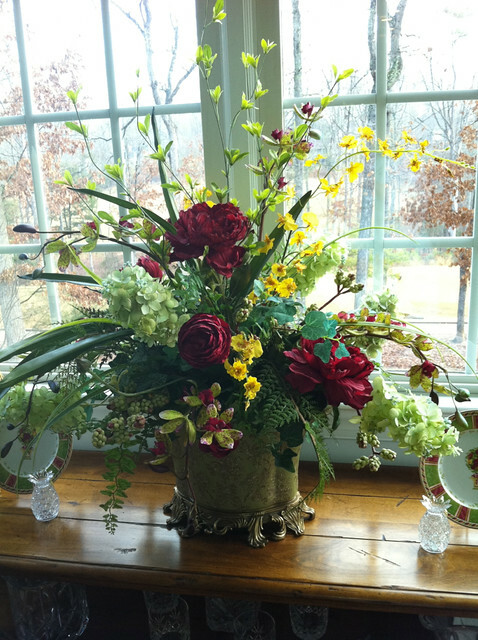 Your faux flowers are so realistic and artfully arranged that most of them should remain in your home and your life. Like others who’ve left responses, I brought this issue up in a blogpost, and decided a mix was the perfect compromise.